An upcoming policy forum by the International Peace Institute will explore tensions between the pursuit of political solutions and the protection of civilians in the context of UN peacekeeping missions. 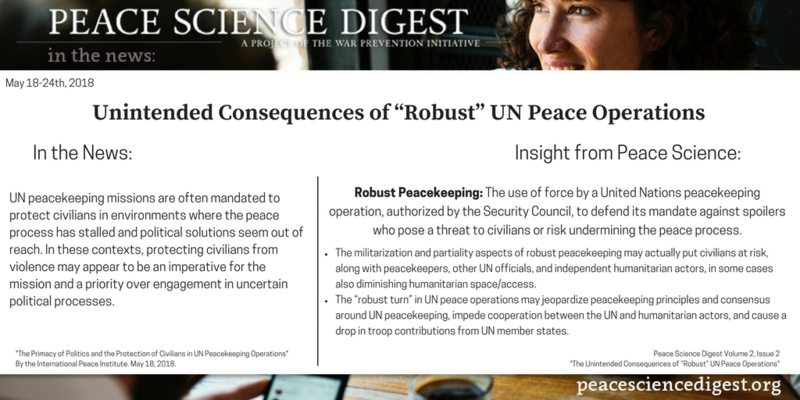 Peace Science shows how the “robust” turn in UN peacekeeping has resulted in unintended consequences to civilians and the peacebuilding process. On Thursday, May 24th, IPI together with the Permanent Mission of the Kingdom of the Netherlands to the United Nations are cohosting a policy forum entitled “The Primacy of Politics and the Protection of Civilians in UN Peacekeeping Operations.” This policy forum will explore the perceived and actual tensions between the pursuit of political solutions and the protection of civilians in peacekeeping contexts. The event will follow the 2018 Security Council Open Debate on the Protection of Civilians organized by Poland (#United4Civilians). -United Nations. (2008). United Nations Peacekeeping Operations: Principles and Guidelines “Capstone Doctrine”. New York: United Nations Secretariat. http://www. un.org/en/peacekeeping/documents/capstone_eng.pdf. “The Primacy of Politics and the Protection of Civilians in UN Peacekeeping Operations”. By the International Peace Institute. May 18, 2018.